The primary goal of the Core Company is to create a comfortable and easy to set up tents. And because of this, they have come up with Instant Technology. As compared to traditional tents, this tent has pre-attached poles. The poles are attached to the tent and are positioned in the right place. This gets rid the need of setting up the poles and sliding them in the sleeves. 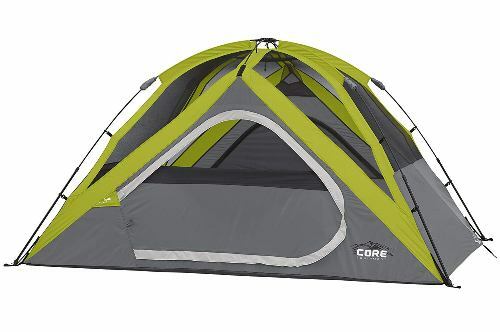 This Core tent reviews feature 6 of the best Instant Technology tent that can accommodate a number of people from 3 person to 12 person. We have included the pros and cons of each item to help you decide. We have designed a comparison table below for your easy reference. However, it is important to note that the positions are in no particular order of importance. It will only take you 30 seconds to set up a Core 3 Person Dome Tent. All you need to do is to merely unpack, unfold and extend since the poles are attached to the tent already. It has H20 Block Technology with water-resistant fabrics and active bead system to let the water flow. The seams are sealed and have a waterproof window and door seals. During summer the taped rain fly can be removed to show the panoramic mesh ceiling and windows. It makes use of a reliable air intake vent to attract cool air in and the mesh ceiling lets the warm air escape to keep you comfortable. This Instant Dome tent has zippered privacy panels on windows and doors. To keep your things organized it has a gear loft with organizer pockets and lantern hook. 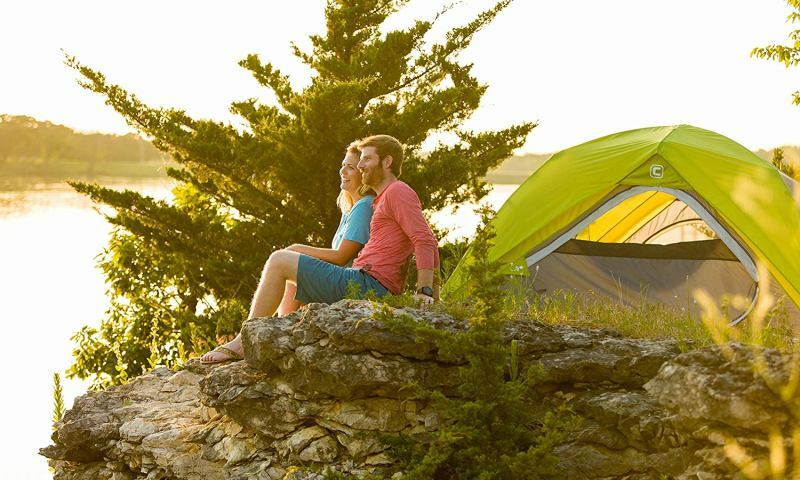 The 4-Person Dome Instant tent can be set up within 30 seconds. Just like other instant Core tents, it has pre-attached poles all you need to do is to unpack, spread and extend. 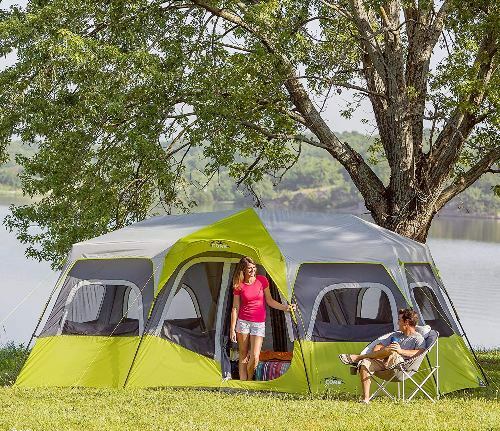 This tent has H20 Block feature and rain-resistant fabrics with active bead system to keep it dry. The rainfly is removable during summer so you can view your surrounding in the ceiling and windows. The ventilation is exceptional, you can adjust the air intake vent created to let the cool air in and the mesh ceiling allows hot air to escape to keep the interior comfortable no matter what the weather is. It has zippered privacy panels on windows and doors to help you organize your gear. One of the essential features for backpacking tents is that it should be lightweight. It must be something that will fit in your backpack together with your other gear, and you should not worry about tearing or having problems if you need to use the tent longer. 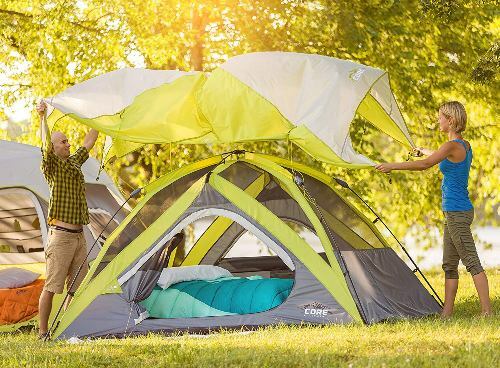 This Instant Cabin tent is easy to set up. Actually, almost all of the Core Instant tent has this feature. According to them you can pitch it within 60 seconds and can take it down easily. The poles are pre-attached and they are telescopic. All you need to do is to carry the tent and then unpack, spread and expand. The task of setting it up can be done by one person easily. This cabin type tent is straightened and tall, having a significant angle with large windows. 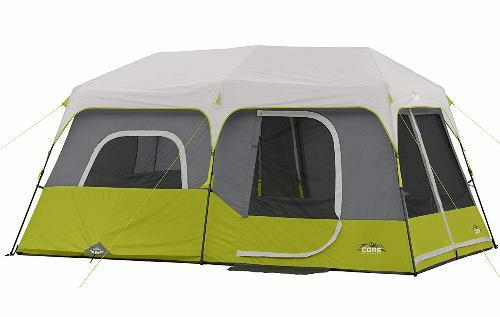 It has a built-in fly so you can view the surrounding even if you are inside the tent. Above the door is a small awning, this is a good feature as it avoids the rain from getting in. 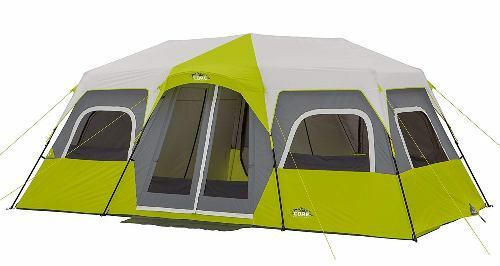 The awning is the main difference between this tent and other 6-person tents. The Core 6 Person Instant Cabin is entirely freestanding and it holds up even if you add the fly because it is connected to the four corners. This means that even after placing the fly on, you can still move the tent around, so can have the best view and orientation. This is a freestanding tent that can be pitched in any terrain. It can stand on its own and it does not require staking but you can do so if you want to. The frame is pre-assembled, so setting it up is easy. The poles are pre-attached, so you just need to unpack, stretch it out and extend. The good thing about these poles is that it is telescopic. You unfold them and extend until you hear a clicking sound which indicates that it is at the right length. 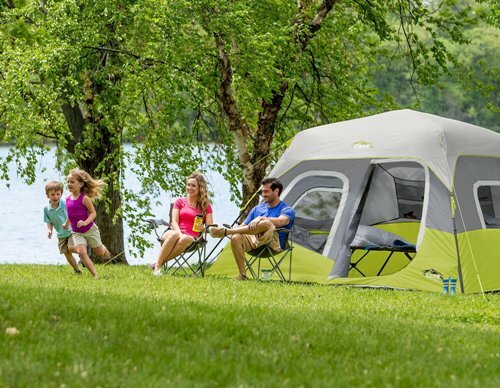 This is a two-room tent which makes it very convenient for your family camping or if you are in a group. This cabin-type tent is very tall that you can move around and the walls are vertical, so you will have a lot of volume inside. This type of tent belongs to a series of tents designed with different sizes. 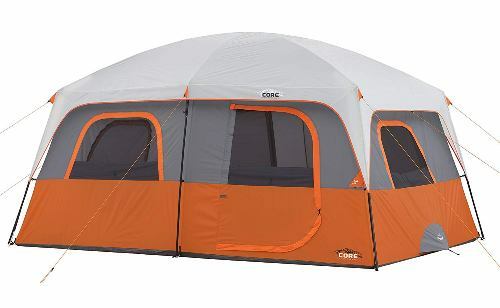 Core 9 Person Cabin Tent is a 3-season or 2-season tent designed for harsh winds and rains. Floor Material: Durable 125 gsm P.E. This is a nicely built tent perfect for summer camping for family and groups. It has a tall and comfortable construction with impressive ventilation, perfect for a warmer climate. This is a typical cabin-style tent with straight walls and a peak height of 86 inches. It offers large windows as if you are at home. This freestanding tent is a bit heavy and is sensitive to strong winds. So you need to stake it properly to the ground. It has a partial coverage fly which protects the mesh ceiling, so the design is a hybrid single-double layer. The doors and windows are double-layered with panels. The tent can be divided to create two rooms. Each room is very convenient as it has its own door and two large windows. There is enough space to move around and you can place a queen size bed. Although it is still best to have a large air bed, having a bed off-ground will provide you space underneath the beds. Floor Material: Durable 115 gsm P.E. 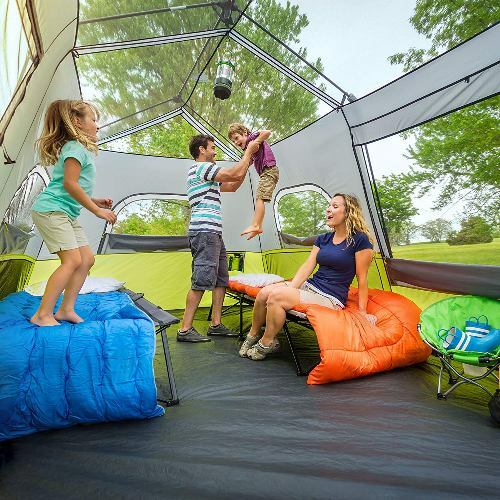 This is one of the largest family camping tents in the market. You can divide the interior into 3 rooms. The setup is easy; it will only take you two minutes to complete it. It is a great structure, before raising it completely the 8 main vertical poles are attached by roof poles. The frame is pre-assembled and connected to the tent. So you need to spread it and extend the telescopic poles. It is also a cabin type and is very tall at 80 inches and steep walls. 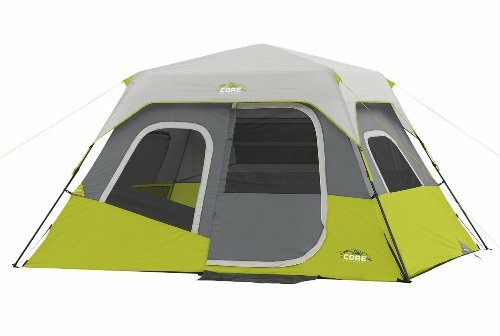 Core's 12-person tent is freestanding so you can stand it on any terrain. Just make sure you have a spacious room. It is a three-season type tent. The tent has a mesh on the ceiling and has huge windows on all sides. This kind of structure will attract cool air and let the warm air out. The fly is minimal, so it is recommended that you use this tent during moderate weather situations. Also check out this article if you are interested to know other brands of camping tents. 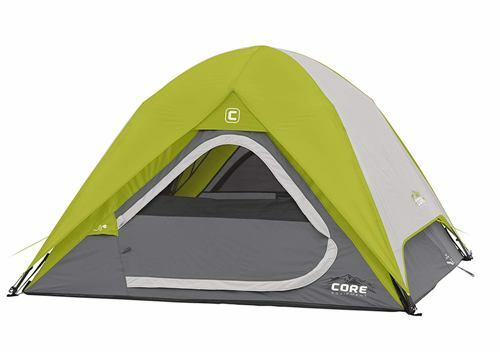 Core is a well-known brand when it comes to a camping tent. It is available from 3-person to 12-person tent so you don’t have to worry if you are camping out with your family or in a group. Just make sure to consider the important factors like fabric material, size, and other important features before buying. If you are solo or 2 campers, we believe with their 3-person instant cabin tent should be able to fit you comfortably without squeezing. If you are in a large crowds and want personal spaces, ie extra rooms, you can consider their 9-person, or 12-person for even larger group. The ​straight wall cabin tent is good for moving around in the tent, which could hold up to 10 persons with 2 queen-sized airbeds. 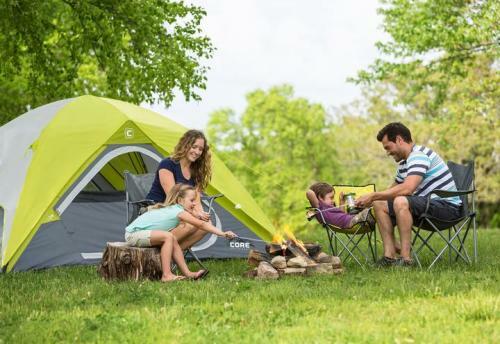 Average small families would always prefer the 4-person and 6-person tent for extra comfort. 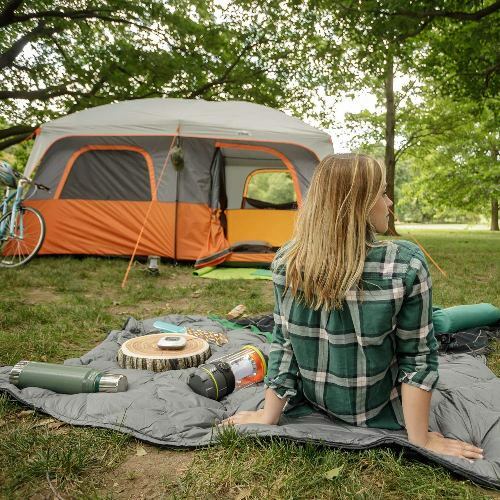 We hope this Core tent reviews helped you in finding the right shelter for your next adventure.